Naval Forces Day is one of the most recent professional days in Turkmenistan. This day was established in 2011 and the first observance took place on October 9, 2012. Establishment of this professional day was initiated by Yaylum Berdiew, Minster of National Security of Turkmenistan. He requested President of Turkmenistan Gurbanguly Berdimuhamedow to provide the personnel of naval forces with a special professional day. The request was approved and President signed a corresponding decree. Naval Forces Day is celebrated on October 9, marking the day of the working visit of Gurbanguly Berdimuhamedow to one of the military units in the suburb of the port of Turkmenbashi. 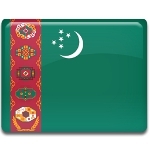 Naval forces of Turkmenistan were created in 2007 in Turkmenbashi. The first missile boats were acquired in 2011. The first naval exercises were conducted in the Caspian Sea in September 2012. Nowadays the naval forces consist of 2,000 servicemen, who accept congratulations from the relatives and state authorities on this day.